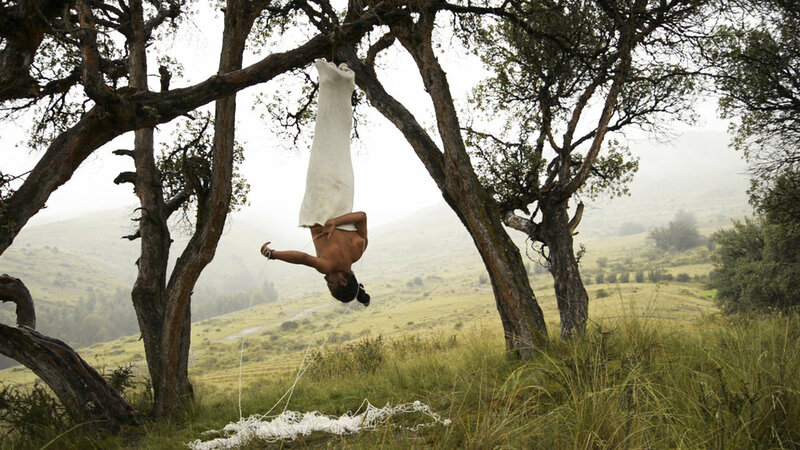 Extracorporeal or, beyond the body, is dedicated to the late artist Ana Mendieta (Cuba, 1948–1985). On the 70th anniversary of her birth, this exhibition explores her aesthetic footprint in the work of contemporary Latin American and Latino artists working in video, performance, photography, and sculpture. Each artist presented here employs the human body (often their own) to explore a variety of themes and modalities of self-expression. In many works, it is through personal narrative that the artists lead us on paths to explore ancestral roots, historical trauma, and more abstract notions of being and belonging. At the core, a sensibility of transcendentalism unites these works. These five artists have uprooted themselves from everyday life to explore what is beyond their fixed position in time and space, whether that be defined as spiritual, transcendental, or simply extracorporeal—beyond the body. Featured Artists include Antonio Paucar (Peru, b. 1973), Carmen Argote (Mexico, b. 1981), Daniela Riojas (U.S., b. 1989), Roberto Tondopó (Mexico, b. 1978), and Tadeo Muleiro (Argentina, b. 1983). Extracorporeal, or Beyond the Body, is organized by the Museum of Latin American Art and is curated by Edward Hayes, MOLAA Curator of Exhibitions.